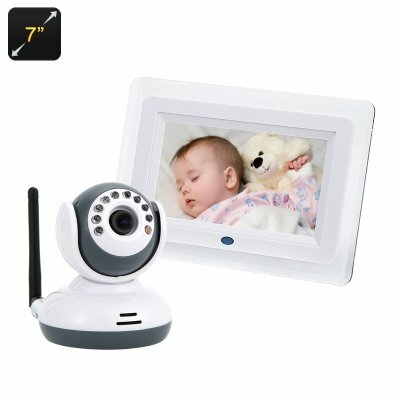 Successfully Added Baby Monitor + Wi-Fi Camera - 1/4 Inch CMOS Sensor, VOX, 7 Inch LCD Display, Night Vision to your Shopping Cart. The Wi-Fi camera features a 1/4 inch CMOS sensor and will be able to provide you with clear visuals 24/7. Thanks to its compact size, the camera can be placed anywhere in your home without drawing too much attention. Its fun toy-like shape also makes it the perfect fit for a child’s room. The camera is equipped with 9 IR LEDs and can offer clear video feedback in any light conditions. Featuring 3-5 meter night vision, its footage and images won’t ever leave you in the dark. The wireless camera and baby monitor also comes with VOX feature which lets you to not only see what’s happening in the room, but also hear. You will also be able to choose between two voice sensitivity modes: high and low. The 7 inch LCD display with 800x480 resolution works as a receiver and lets you conveniently see your footage a portable screen and in real time. The Baby Monitor + Wi-Di Camera comes with a 12 months warranty, brought to you by the leader in electronic devices as well as wholesale Baby monitors..